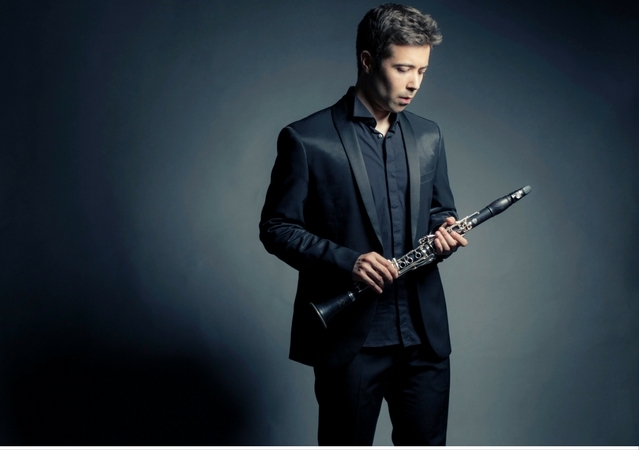 The Spanish clarinetist Pablo Barragán performed his solo debut at the Lucerne Festival in a recital streamed by the RTS (Swiss Radio Television) and published in live CD recording by the Credit Suisse Foundation. The critics defne him as an outstanding musician not only for his overwhelming playing, but also for his stage presence, passion, capacity of communication and sensibility. Awarded Prix Credit Suisse Jeunes Solistes 2013, among other several international competitions such as ARD Munich International Competition 2012, 1st Prize Juventudes Musicales de España 2011 or the Special Prize of European Music Competitions for Youth 2011 (EMCY), Pablo is renowned as one of the most versatile and interesting musicians of his generation. Pablo has performed regularly with orchestras such as Sinfonieorchester Basel, Orquesta de Radio Television Española, Bratislava Sinfonietta, Malaga Philharmonic Orchestra, Orchestre du Chambre Delemont, Orquesta Betica de Camara and Neues Orchester Basel, working with conductors Clemens Schuldt, Adrian Pravaba, Gabriel Feltz or Christian Knüsel among others. In recital, Pablo has been part of major festivals around Europe such as Gstaad Menuhin Festival or Schloss-Elmau Kammermusik Wochen, and touring around Switzerland and Spain together with his chamber music partner Maki Wiederkehr. He has performed in festivals and venues such as Mecklenburg Vorpommern Festpiele, Salzburg Kammermusik Fest, Young Euroclassics Berlin, Davos Festival, Berlin Philharmonie, Schlewig-Holstein Festpiele, Lingotto Torino, Auditorio Nacional de Madrid, Sommer Kammermusik Zurichsee, Montecastelli Pisano Festival under the artistical direction of Henrich Schifft, L’Auditori and Palau de la Musica de Barcelona, or Wuppertal Kammermusik Festspiele, among many others. Highlights in the next seasons include his solo CD recording with Orchestre Musiques des Lumieres under his artistical director Facundo Agudin, performing Mozart Concerto kv 622 and the new creations by the renowned composers Marco Perez Ramirez and Dominique Gessenay-Rappo, touring in Switzerland and Argentina during seasons 2017/18. Debuts with the Slovak Chamber Orchestra performing and conducting Copland Concerto, Mozart Concerto at the Murten Classics Festival in Switzerland, as well as Konzerthaus Berlin and Winterthur Casino Theater. As chamber musician, Pablo performs with Maki Wiederkehr, Esther Hoppe, Goldmund Quartett, Benjamin Engeli, Belenus Quartett, Cristina Gomez Godoy, Gabriel Schwabe, Tobias Feldmann, Daniela Koch, Theo Plath, Gabriele Carcano… taking part at some of the most interesting concerts cicle for young generation of musicians. As a curious artist, interested in new musics and creation, together with the soprano Laurence Guillod and the visual artist Leandro Suarez, they will premiere their “NothingTwoSay”, exploring the physical limits of the communication though the texts of John Cage and music by Berio, Sariaaho and Fröst. Since 2007, Pablo is member of the West-Eastern-Divan Orchestra, under the batton of Maestro Daniel Barenboim, performing concerts in the best audiences and festivals all over the world. He has collaborated as well in the projects of musical education that the foundation is developing in the Middle East invited as a professor at the Barenboim-Said Foundation. Born in Marchena (Seville) in 1987, Pablo Barragán studied at the conservatory with his mentor Antonio Salguero and at the Barenboim-Said Foundation with Matthias Glander. He was a member of the Orquesta Joven de Andalucía under Michael Thomas musical direction, been part of a powerful Andalusian generation of musicians. In 2009 he was granted a scholarship by Fundación Caja Madrid and moved to the city of Basel (Switzerland), to study with the Professor François Benda. He studied chamber music with the Professors Anton Kernjak, Ferenc Rados, Benjamin Engeli, Felix Renggli and Sergio Azzolini, and he has taken masterclasses and advices from renowned clarinetists like Martin Fröst, Charles Niedich, Reto Bieri, Dimitri Ashkenazy, or Vicente Alberola.